How did you hear about the Marcedes Lewis Foundation? Well I believe my dad worked with mom and for my birthday he got me a signed jersey. When I got the jersey my dad told me about the camps he holds and the foundation he runs. After I found out about how much money I needed to raise I immediately thought about asking the foundation if they could help support me. How did you connect with Marcedes and the Foundation? When I first got my jersey I called Marcedes to thank him and he talked to me about what I need to do to play with the big boys. I thought it was so amazing to talk to a pro football player that I saved his number and made sure I always transferred it to my new phone! One day I called and emailed him asking him if he could help me out with my senior project. How did you find this cause? And what was it that drew you to helping? In the state of Washington you can’t graduate unless you complete a “senior project” so while searching for a project I remembered a couple of my friends had gone to Peru the year before to do the same thing I was looking at doing. I was drawn to this because I felt like this wasn’t an ordinary domestic project. This was an opportunity to help the less fortunate and not something that just benefits me. Can you tell us a bit about what you did out there? 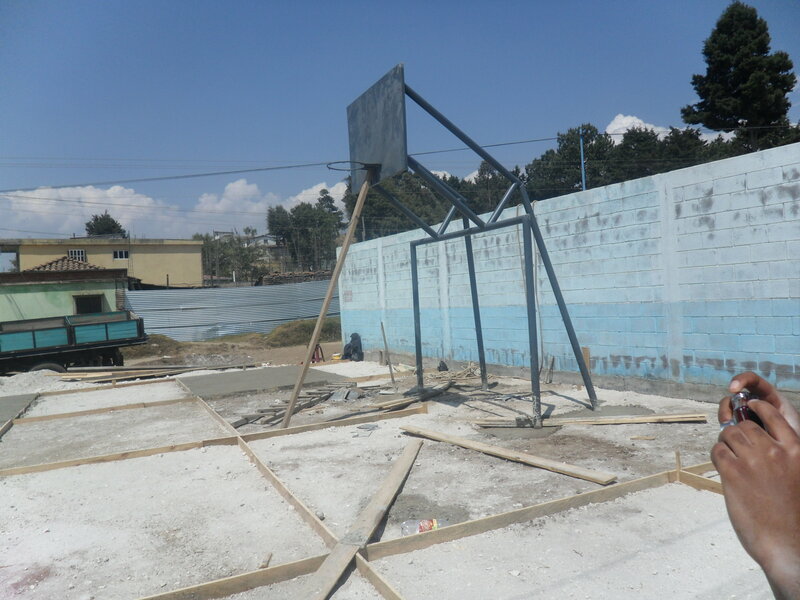 While in Guatemala we went to a small community call Urbina, Cantel and built a basketball court for a local school there. We built the court from scratch so we had to make the cement and lay it all down. It required a lot of rocks, sand, water, and cement bags. Each bag weighed about 90lbs and we unloaded at least 150 bags. It was hard because not everyone was capable of lifting these bags so I and a couple others had to carry a lot of the weight but it didn’t bother me any because I was there to make a difference and to make good progress someone has to step up and put the team on their back. What is the main thing you have taken away from this experience? The main thing I took out of this experience was to appreciate the things I do have and not to worry about the things that I don’t. The Guatemalan people had little to nothing and lived in houses that were half way made out of dirt but I am willing to argue they are happier than most of the people in America! They have this word I will never forget which is “Tranquilo” It basically means be calm and relax. Whenever something went wrong while building the court the people would always say “Tranquilo” and then they would find something to keep them busy. I would like to say thank you to the Marcedes Lewis foundation. Without them I wouldn’t have been able to go on the trip, and without this trip I wouldn’t have been able to graduate. I am very thankful for their donation and they definitely helped me get to where I am now. Thank you Marcedes and all the Foundation volunteers.